If you are looking for a great portable photo printer, then look no further than Canon. Canon photo printers should be your first destination for those looking for a quality and value for money portable printer. Although the Canon photo printers are not the smallest of the portable photo printers (such as the Polaroid ZIP) but they are bulging with features, with LCD displays and card slots for storing pictures. This printer is slightly less portable then most at 5.4 x 7.1 x 2.5 inches, but what it lacks in portability it makes up for in features and the print quality. With a built-in display, optional battery pack (that can handle 54 prints) and multiple print sizes for postcards, square labels and more, the Cannon Selphy CP1200 is made to get the job done in style! The Selphy CP910 is super simple and fun to use, and is a slightly cheaper alternative to the Canon Selphy CP1200. This compact device is designed to print multiple products such as postcards, photos, or mini stickers. It supports most mobile and tablets, and has a display, USB ports as well as a SD card slot to print directly from card. 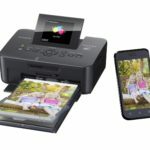 When deciding on what the best portable photo printer is for you, you may need to consider various factors that will influence your decision to help you can check out our photo printer guide. 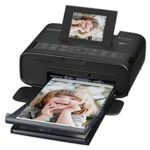 You may like to check out out other brands we review such as Polaroid, HP and also other ZINK and inkless printers.